Paperback, 128 pages “All history,” writes Maximillian Alvarez in his contribution to this issue, “is the history of empire—a bid for control of that greatest expanse of territory, the past.” Evil Empire confronts these histories head-on, exploring the motivations, consequences, and surprising resiliency of empire and its narratives. 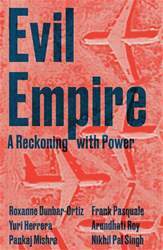 Contributors grapple with the economic, technological, racial, and rhetorical elements of U.S. power and show how the effects are far-reaching and, in many ways, self-defeating. Drawing on a range of disciplines—from political science to science fiction—our authors approach the theme with imagination and urgency, animated by the desire to strengthen the fight for a better future. Featuring Nikhil Pal Singh, Arundhati Roy interviewed by Avni Sejpal, Roxanne Dunbar-Ortiz, Yuri Herrera translated by Lisa Dillman, Pankaj Mishra interviewed by Wajahat Ali, Frank Pasquale, Adom Getachew, Maximillian Alvarez, Jeanne Morefield, Michael Kimmage, Stuart Schrader, Marisol LeBrón, and Mark Bould.